Reliable estimates of the magnitude and frequency of floods are essential for the design of transportation and water-conveyance structures, flood-insurance studies, and flood-plain management. Such estimates are particularly important in densely populated urban areas. In order to increase the number of streamflow-gaging stations (streamgages) available for analysis, expand the geographical coverage that would allow for application of regional regression equations across State boundaries, and build on a previous flood-frequency investigation of rural U.S Geological Survey streamgages in the Southeast United States, a multistate approach was used to update methods for determining the magnitude and frequency of floods in urban and small, rural streams that are not substantially affected by regulation or tidal fluctuations in Georgia, South Carolina, and North Carolina. The at-site flood-frequency analysis of annual peak-flow data for urban and small, rural streams (through September 30, 2011) included 116 urban streamgages and 32 small, rural streamgages, defined in this report as basins draining less than 1 square mile. The regional regression analysis included annual peak-flow data from an additional 338 rural streamgages previously included in U.S. Geological Survey flood-frequency reports and 2 additional rural streamgages in North Carolina that were not included in the previous Southeast rural flood-frequency investigation for a total of 488 streamgages included in the urban and small, rural regression analysis. The at-site flood-frequency analyses for the urban and small, rural streamgages included the expected moments algorithm, which is a modification of the Bulletin 17B log-Pearson type III method for fitting the statistical distribution to the logarithms of the annual peak flows. Where applicable, the flood-frequency analysis also included low-outlier and historic information. Additionally, the application of a generalized Grubbs-Becks test allowed for the detection of multiple potentially influential low outliers. Streamgage basin characteristics were determined using geographical information system techniques. Initial ordinary least squares regression simulations reduced the number of basin characteristics on the basis of such factors as statistical significance, coefficient of determination, Mallow’s Cp statistic, and ease of measurement of the explanatory variable. Application of generalized least squares regression techniques produced final predictive (regression) equations for estimating the 50-, 20-, 10-, 4-, 2-, 1-, 0.5-, and 0.2-percent annual exceedance probability flows for urban and small, rural ungaged basins for three hydrologic regions (HR1, Piedmont–Ridge and Valley; HR3, Sand Hills; and HR4, Coastal Plain), which previously had been defined from exploratory regression analysis in the Southeast rural flood-frequency investigation. Because of the limited availability of urban streamgages in the Coastal Plain of Georgia, South Carolina, and North Carolina, additional urban streamgages in Florida and New Jersey were used in the regression analysis for this region. Including the urban streamgages in New Jersey allowed for the expansion of the applicability of the predictive equations in the Coastal Plain from 3.5 to 53.5 square miles. Average standard error of prediction for the predictive equations, which is a measure of the average accuracy of the regression equations when predicting flood estimates for ungaged sites, range from 25.0 percent for the 10-percent annual exceedance probability regression equation for the Piedmont–Ridge and Valley region to 73.3 percent for the 0.2-percent annual exceedance probability regression equation for the Sand Hills region. The file is designed as a tool for computing flood-frequency characteristics and the associated prediction intervals for ungaged urban or small, rural streams in Georgia, South Carolina, and North Carolina. 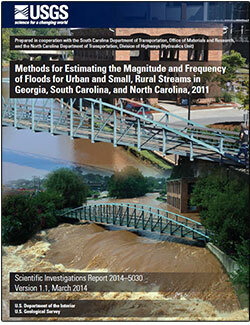 Estimating Flood Magnitude and Frequency for Urban and Small, Rural Streams in Georgia, South Carolina, and North Carolina, 2011. Feaster, T.D., Gotvald, A.J., and Weaver, J.C., 2014, Methods for estimating the magnitude and frequency of floods for urban and small, rural streams in Georgia, South Carolina, and North Carolina, 2011 (ver. 1.1, March 2014): U.S. Geological Survey Scientific Investigations Report 2014–5030, 104 p., http://dx.doi.org/10.3133/sir20145030.